The top public and private companies in Florida, as ranked by revenue. Collectively, revenue at Florida’s 350 largest companies rose $38.2 billion over the past year, with private company revenue rising 9.3% compared with an 8.2% rise at public companies. The cutoff for public companies is $3.5 million, compared with $3.0 million last year. Among the privates, the 200th-ranked company posted revenue of $75 million this year, up $4 million from 2011. The 150 public companies combined brought in $95.1 billion more than the 200 private companies. Overall, about a quarter of the public companies -- 37 companies -- reported lower revenue. On the private side, only 16.5% of the companies on the list reported lower revenue -- 33 companies. Our exclusive rankings of the 200 largest privately held and 150 top publicly traded companies in Florida are available for purchase in either PDF or Excel format. The lists may be downloaded separately or purchased together at a special package rate. Excel versions of both lists include hundreds of additional contacts not previously published, PLUS phone, fax, full mailing address, number of employees, and more! Click here for more details. Quiz: Do you know what some of Florida's largest public companies do for a living? 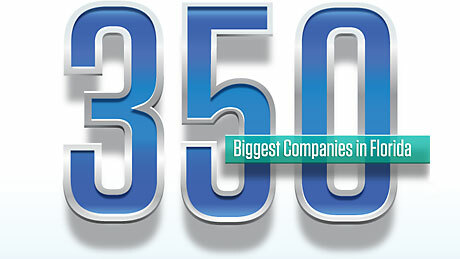 Public company profile: Cott Corp.
Quiz: Do you know what some of Florida's largest private companies do for a living?